This vintage style bracelet features a replica of the historic map of Saint Augustine, Florida's famous Castillo de San Marcos. 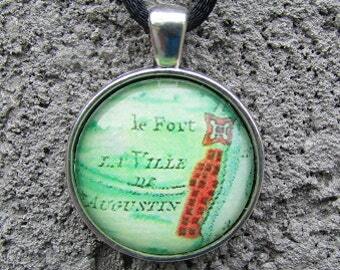 The original map is titled, St. Augustine and its environs, and was created in 1782. The original map was hand-drawn and colored in beautiful blue hues. The map replica is set in a large (31 mm) ornate circular screw back bezel and is finished in antiqued .999 Fine Silver. 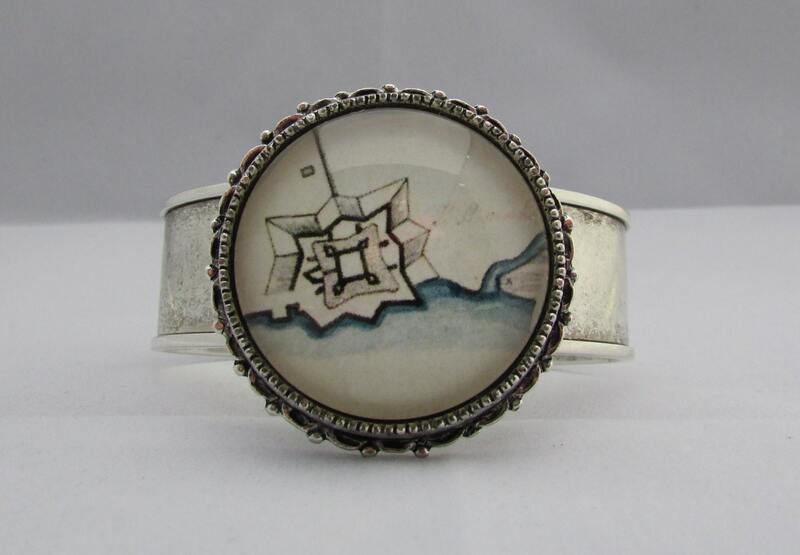 The bezel is attached to an antiqued .999 Fine Silver plated 0.75 inch wide channel cuff bracelet. The finished glass cabochon is domed shaped and magnifies the beautiful image and the backside of the bezel is patterned. This bracelet is also available for a custom order. You can select any map image from the site or you can send me a custom image. Please email me if you are interested.